Microbial Fuel Cells (MFC) could generate electrical energy combined with the wastewater treatment and they can be a promising technological opportunity. 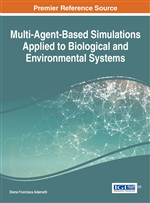 This chapter presents an agent-based model and simulation of MFC comparing it with analytical models, to show that this approach could model and simulate these problems with more abstraction and with excellent results. A lot of research has been done with the energy and environment issues. About this subject, the environmental damages mitigation and the research for renewable energy solutions are some of the mains topics. Studies indicate that the bacteria could generate electrical energy combined with the wastewater treatment, resulting in a promising technological opportunity (Logan, 2008). In this way, computational modelling and simulation bring tools that could expand the understanding of systems and processes with economic and time advantages in face to build pilot plants, prototypes and experimental planning and execution. It is known that just the modelling and the simulation could not bring all the real aspects and variables. Nevertheless, its uses can offer more confidence to the planning and development of strategies in order to fulfill experimental tests (Maria, 1997). In Brazil, according to the last Basic Sanitation Census done in 2008, 34,8 million people live without sewerage system and treatment. It represents 44,8% cities without this basic service. And worst, the number of treatment is much less than the disposal presented, about 10%. This reflects in costs to the public health systems and in environmental impacts in medium and long time. There are some technical difficulties reasons to offer basic sewage treatment. In one hand, there is the economic viability to build and operate wastewater treatment plants, since exist a minimum population that turn the economic trade-off positive in a city. In other hand, there is the energy availability. In a huge country with geographical difficulties, the cities with more necessity of basic sanitation probably do not have energy required to run the plant. And, in small cities with electrical energy, the cost of the energy to use pumps and aerators turns the implantation of water treatment economically negative. If these costs could be mitigated, the construction of small profitable treatment plants could be made in remote places. Analyzing the progress of energy matrix in Brazil, it is possible to see that it has good developed in terms of renewable energies. According to the last report of Ministério de Minas e Energia (Ministry of Mines and Energy - Brazil), Brasil has 39% of its energy matrix composed by renewable energy, against 10% of OECD1. The CO2 emission of Brazil are less than OECD, where Brazil has 1,59 tco2/tep versus 2,31 tco2/tep to OECD. These characteristics reflect a country with energy diversity and adapted to the new energies and environmental world scenario concerns . However, with the economic growth, the energy demand increase 3,1%, more than the GNP (Gross National Product) of 0,1%. This shows an economic issue due to not supported Brazilian development. Therefore, potential of new fonts of renewable energy and technology show promising roles, and the possibilities of a sustainable growth with MFC technology could be reached. The use of MFC technology in wastewater treatment plants could support the build of sanitation plants in place that nowadays are difficult. The sewage contains great amounts of energy in form of organic matter. This matter can feed the bacteria present in the anodic chamber. Copper et al apud Logan (2008) state that the energy content of wastewater is up to 5,9 times greater than the power used in wastewater process. Therefore, the metabolic activity of these bacteria has ability to lower the BOD and COD of wastewater and the same time that generate energy. Logan (2008) exemplify this potential, using a scenario of a town with 100 000 people. The save of the plant in one year, considering the typical efficiencies of MFC, could reach 5 million dollars. In order to calculate it, he shows the energy supply of 1700 homes, considering The United States consumption level. This potential combined with other energy recuperation, as methane combustion in a generator, turn the wastewater plant from a consumer of energy to a net producer. This application shows a special use of MFC technology and point out to the new energy paradigm that is to implement distributed energy saving technology spread industrial and residential process. The economic and environmental benefits appear through fitting application characteristics with the technology advantages.